Almond fruit are botanically classified as a drupe and consist of an exocarp (skin), mesocarp (hull), and the shell, which is hardened endocarp. Almonds are diploid (2n=16) and almond species exhibit gametophytic self-incompatibility. The center of origin for almond is found in central Asia, with subsequent expansion to European and North African regions, often following ancient trade routes. Almond species are split into two different subgroups, Amygdalus and Dodecandra. The genome of cultivated almond is closely related with peach, and readily crosses with peach and other wild almond species. Almond trees bloom before many other nut species because of their low chill accumulation requirements; however, they do not perform well in locations where summer rains or no winter chill is accumulated. Trees can grow up to 20 m tall and are well adapted to Mediterranean and/or desert climates with mild winters and warm spring and hot and dry summers. Almonds are unique in the Rosaceae family because the nuts rather than the fruit are consumed. 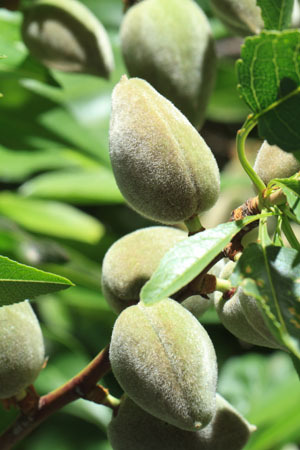 Although many wild almond species have seed that are bitter and produce cyanogenic compounds; cultivated almonds have sweet, edible seed. The genetic mutation for sweet seed production over bitter, cyanogenic seed is dominant unlike in peach and apricot. California almonds are distinct from European types because of their “paper shell” which allows for easier harvest as well as greater harvest of desirable kernel meats over woody shells. Almonds are a popular snack item and they are high in protein and linoleic acid. Almonds are also processed into a paste which is used in marzipan for pastry creations and processed for almond/amaretto extracts. Goals in almonds breeding programs include disease resistance, self-fertility and improved water use efficiency.